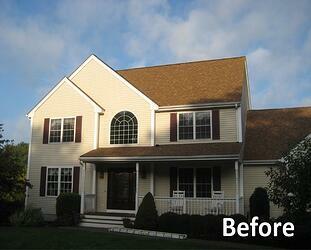 Looking for a siding contractor in Ashland, MA? Here is a project we completed in your area. 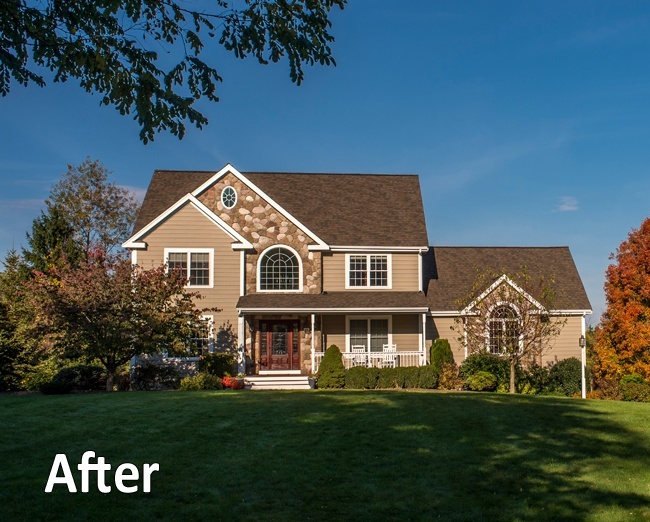 This house in Ashland, MA is less than 15 years old but the vinyl siding was shabby and detracted from the appearance and value of the home. We stripped the existing siding, installed new house wrap and new Everlast Composite Siding in the Misty Taupe color. We also installed cultured stone on a section of the front as an accent and replaced most of the trim. What a transformation! Should this homeowner ever sell their house, they will get back the value of their siding and then some just from the added curb appeal. What is Composite Siding Made of? Everlast™ was developed, tested, refined, and improved over the past decade by a materials laboratory under one of the largest building manufacturers in the world. Everlast Composite Siding is a unique siding product and it is recommended that you have a trained crew perform installation. Is Painting Vinyl Siding a Good Idea? United Home Experts 60 Pleasant St. Suite 1 Ashland, MA.